Robyn Ward is a contemporary Irish painter currently based between London and Los Angeles. A self-taught artist, he began his career as a teenager on the streets of Belfast in Northern Ireland, creating large-scale graffiti work on bridges and derelict buildings. He now works in mixed media on canvas, combining acrylics, inks, watercolours, oils and spray paint. 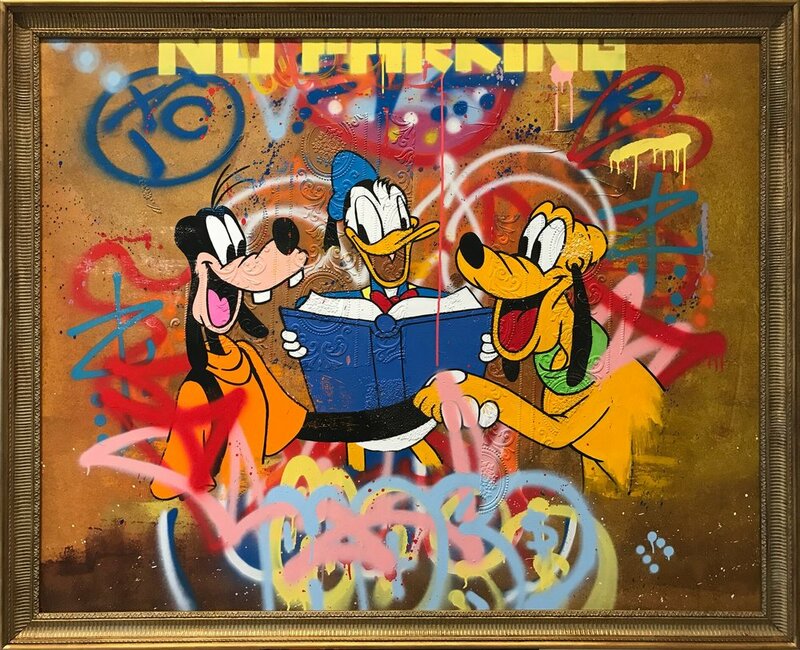 In his most recent series, iconic cartoon characters are hand-drawn onto backgrounds of graffiti, often painted over a coarsely textured surface. The initial impression of childhood nostalgia and innocence conveyed by the cartoon characters is subverted by their actions, nodding ironically to drug culture, politics, socio-economic issues and contemporary sexual mores. Ward juxtaposes the cosy, domestic world of early youth with the gritty visuals of adolescent rebellion and a distinctly adult sensibility, to create work that is restlessly interrogative and darkly humorous. Drawing diverse inspiration from Abstract Expressionist Jackson Pollock, pop artists like Andy Warhol and Jean-Michel Basquiat, street artist Banksy and the surreal imagination of Hieronymus Bosch, Ward’s multi-layered and multi- faceted paintings capture the lurid kaleidoscope of Western society in the 21st century. Based in London and LA, Robyn paints each one of his series in a different locations, absorbing the culture and atmosphere. He is currently working on his next series in Mexico City and his work is being featured in the Art Attack Exhibition at Le Royal Monceau gallery in Paris with artist such as Jeff Koons, Mr. Brainwash and Bansky among other greats.